For commercial quality & general engineering use, these are produced at Manaksia's Haldia Plant, West Bengal. Manaksia’s Aluminum Flooring Sheets with option of 5 Bar & Diamond Pattern are produced in Haldia Plant and has got wide range of application. Manaksia also has pattern sheet / coil in its product basket with an option of Diamond Embossed & Stucco Embossed for a wide spectrum of application. Manaksia offers an ideal means of providing ‘covers’ to all kind of structures via Aluminium Profiled Roofing Sheet. Manaksia being the pioneer in almost every packaging application produces Closure Stock Coil to suit the growing demand in the packaging field. 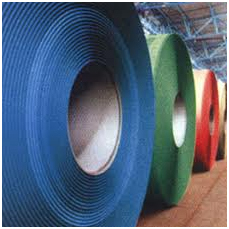 Production process of colorcoated coil..